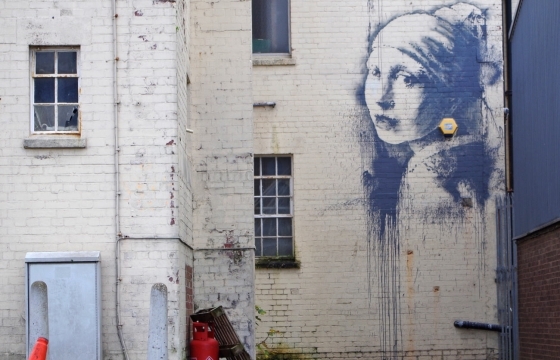 Banksy has dropped a few new pieces over the past weeks, and we really like this "Girl with a Pierced Eardrum" work that was put up in Bristol, England found near the city's harbor. The piece is obviously an ode and update to the Dutch painter Johannes Vermeer's Girl with a Pearl Earring, which if you remember was the subject of a Scarlett Johansson-starring movie. We just wanted Banksy and Scarlett in the same post, and we achieved our goal.